...(more information below FYI) and wondered if you are aware of it and whether you might consider making Abyss automatically handle the creation, use within Abyss and renewal of their free security certificates? It seems like it will be a good way of https securing a web site hosted in Abyss without much cost or effort. I will look forward hearing your thoughts on this. Can I get a certificate for multiple domain names? Yes, the same certificate can apply to several different names using the Subject Alternative Name (SAN) mechanism. The Let's Encrypt client automatically requests certificates for multiple names when requested to do so. The resulting certificates will be accepted by browsers for any of the domain names listed in them. That list of domains will be fine for Let's Encrypt. I would really appreciate a reply from Aprelium to my question about the possibility of interfacing with this service from Abyss. I would VERY MUCH like to use let's encrypt with Abyss. Any thoughts on Abyss support for this service. This is a first of it's kind - automatic request, signing, installation, and renewal of certificates - FOR FREE. No more expired certificates and lengthy trouble tickets to get renewals installed. This guy has created a windows client for IIS. He has developed a plugin architecture for his client so plugins can be written for other servers (Such as Abyss). How about it? Anyone up to the task of coding a plugin for Abyss for this guys Let's Encrypt windows client? It's definitely beyond my abilities. It's been five months since I posted this question. I also emailed and sent private messages to Aprelium and received no reply. This makes me wonder if all is well at Aprelium. I do hope so. Have serious doubts, unable to found Aprelium SARL in Tunisian commercional registry..
* In the displayed form, type "Aprelium" in "Nom commercial"
* You'll get a page with more details about the company. ACME is the protocol used to automatically request certificates from certification authorities such as "Let's Encrypt". I saw this single row, but not discovered the 'eye' is clickable. Than you for step by step guide. That is really good news! I will look forward to it. Hi there. Any word on ACME support for Let's Encrypt? Posted: Sat Dec 31, 2016 1:59 pm Post subject: I'd like to see it too! Thanks Aprelium, and happy new year! It seems the planned version 2.12 release did not arrive in Q4/2016. However, I'm still really looking forward to ACME protocol support and would appreciate a progress update from Aprelium if possible. Ditto that! Hope v. 2.12 can come soon with Let's Encrypt functionality. Just bumping this up, wondering if there's any response from the support team about ACME support? I'm anxiously waiting for this too. Being able to support the users of my websites with some encryption seems pretty important these days. I just re-upped for 2 years of support, I'm hoping that a little bit of money might bring them back here to see there are still some users who are willing to pay and who want to see development continue. Just popping in with an update request: Been a while since we've heard from Aprelium staff about how development is going. Any updates? The version 2 of ACME protocol is adding wildcard certificates for subdomains. Posted: Tue Jul 11, 2017 1:06 pm Post subject: any hope? I wrote both to contacts and support more than 3 times in the last 14 months, and never got an answer. Posted: Fri Aug 11, 2017 7:35 pm Post subject: Re: any hope? think it could be ready before the end of 2017. Hey all. Just wanted to let you know I got Let's Encrypt working with Abyss on Windows! There's a little bit of rig-a-ma-roll to make it happen, but it's not too complicated. I hope to be posting a better tutorial within a few weeks. From the latest release, download le32.zip or le64.zip, depending on your operating system (32/64 bit). Extract the zip file to a folder of your choice on your server. It must be a writable directory. In your router, forward TCP port 443 to your server (like you've already done for port 80). For any domain you want to get an SSL certificate, you must create two folders in the web root directory. Windows Explorer won't allow you to do this. The workaround is to append a period at the end of the directory name. Remember: Do this for every domain you want to enable SSL for. Now build your argument list for le32.exe (or le64.exe). *Change to your email address. This is an optional parameter, but it's for "email for expiration notifications". *The parameters key, csr, csr-key, and crt define files that will be created in the folder where le32.exe resides. *Note: Every time you create certificates with this program, use the same account.key file. *Note: You can specify several domains in the domain parameter. Make sure to put the corresponding path in the path parameter. The first domain corresponds to the first path and the second domain corresponds to the second path, etc. Take all the arguments after you've altered them (ideally in notepad), and condense them into one line. Copy and paste into a command prompt (right-click --> Paste) after you've navigated to the folder with le32.exe. 2017/08/11 22:08:55 Domain verification results for 'demo.go2.rip': success. 2017/08/11 22:08:55 You can now delete the 'c:\web_docs\demo.go2.rip\.well-known\acme-challenge/2gsfhMM-KekeTxKp373hgOj93mjh3FT7JufPQBmL4VA' file. 2017/08/11 22:08:57 Domain verification results for 'www.demo.go2.rip': success. 2017/08/11 22:08:57 You can now delete the 'c:\web_docs\demo.go2.rip\.well-known\acme-challenge/7KFbbpCFhU5MveHdr60x83yWv3XcfdHYUbhqtsNavKY' file. 2017/08/11 22:08:57 Requesting domain certificate. 2017/08/11 22:08:58 Requesting issuer's certificate. 2017/08/11 22:08:58 Saving the full certificate chain to demo.go2.rip.crt. 2017/08/11 22:08:58 ===> NOTE: You have been using the test server for this certificate. To issue a valid trusted certificate add --live option. To issue a valid trusted certificate add --live option. So tack on -live to the argument list (only a single dash as the double dash is for Linux use). Adding -live will alter the .crt file. 2017/08/11 22:25:52 Domain verification results for 'demo.go2.rip': success. 2017/08/11 22:25:52 You can now delete the 'c:\web_docs\demo.go2.rip\.well-known\acme-challenge/merGFw9B7azpn72vKNNJqMHh4LpS49vduhhU252vaHM' file. 2017/08/11 22:25:55 Domain verification results for 'www.demo.go2.rip': success. 2017/08/11 22:25:55 You can now delete the 'c:\web_docs\demo.go2.rip\.well-known\acme-challenge/1VSyuELTt10xdcYKF5l2Dp-XPY2677XaxTy-mhTyoNI' file. 2017/08/11 22:25:55 Requesting domain certificate. 2017/08/11 22:25:55 Requesting issuer's certificate. 2017/08/11 22:25:55 Saving the full certificate chain to demo.go2.rip.crt. Now that we have a full-fledged certificate file, we will now import the SSL certificate into Abyss. Load up the Abyss console in your browser. In the Private Keys table, click Add. Create a name for this private key. Let's call it 'Abyss-LE' for this example. Under key contents, insert the contents of demo.go2.rip.key file (the one created with the -csr-key parameter). Give it a name. Again, for example, let's use 'Abyss-LE'. Choose your 'Abyss-LE' private key. Set 'Type' to 'Signed by a Certification Authority (CA)'. Under Main Certificate, open up demo.go2.rip.crt (the file specified in the -crt parameter). You'll notice there are two certificates here. Select only the first one and paste it into Main Certificate. The second certificate should be pasted in 'Intermediate Certificate'. The CA Root Certificate can be blank. Now navigate to your host and click 'General'. Select the certificate you created. Restart Abyss. Now you're serving HTTP & HTTPS. Congrats! Note: I made some minor edits with the parameters when running the LE32.exe file (forward/back slashes and trailing slashes) so that the program will function correctly. Here's another website I've secured with HTTPS in Abyss. These certificates are good for three months, but you can't renew before 60 days. So I'll have to give an update on how to renew properly when the time comes. One more thing: To help with debugging, you can test your SSL setup here --> https://www.ssllabs.com/ssltest/. And my demo scored an A rating. Posted: Tue Aug 22, 2017 5:03 pm Post subject: Thanks! Thanks for the guide pkSML! It has been really helpful. Let's hope native ACME support comes to Abyss.. the problem with Let's Encrypt is the very short certificate life. Sure, your procedure can be turned into a scheduled task, but things are complicated.. Thanks pkSML, you must have spent quite some time digging around and preparing that information. I too am still hoping Abyss will include easy to use auto-updating ACME / Let's Encrypt support in a future update. In about a month, I hope to share some info on how to set up an auto-renew script for Let's Encrypt certs on Windows. A new version of Abyss Web Server is in the works and nearing the Beta stage. Since this is a huge new feature, we'll welcome any help testing it. If you are interested to get the new Beta version when available, please let us know (a reply to this message or an email with a reference to this thread would suffice). I am absolutely interested in beta testing this feature. Thank you for your offer to help. We will contact you as soon as the Beta will be ready. Please SEARCH the forums BEFORE asking questions! I am interested in this as well!!!! That sounds great. I'd definitely be interested in exploring the possibility of testing the Beta version. I'd be happy to beta test LE also. Thanks! i would like to test beta version.. thank you. Thank you all for expressing your interest in the Beta of 2.12. Things are moving forward and we're happy to point you to this mini-announce https://aprelium.com/forum/viewtopic.php?p=655187#655187 . Posted: Fri Dec 21, 2018 6:45 pm Post subject: SSL for intranet sites? I'm trying to create a Lets Encrypt certificate for a host I have running on our intranet. I'm trying to run a custom WebDAV calendar and it really wants to use SSL for the connection so I need to get this to work if I can because it (and Chrome) doesn't like self-signed certs. I can also go into more specifics if necessary. Posted: Sat Dec 22, 2018 10:09 pm Post subject: Re: SSL for intranet sites? This error is reported by Let's Encrypt which does not issue certificates for IP addresses. By the way, most certification authorities have the same rule: no SSL/TLS certs for IP addresses. You can't issue certiticates for localhost. This is again a limitation from Let's Encrypt. But it makes sense: Let's Encrypt needs to verify that you own your domain name submitted for a free certificate. For that, it sends a challenge to ACME-bot on Abyss Web Server and it expects to contact your server from the Internet to validate the challenge. How could it contact your localhost which is by definition only valid inside your network? 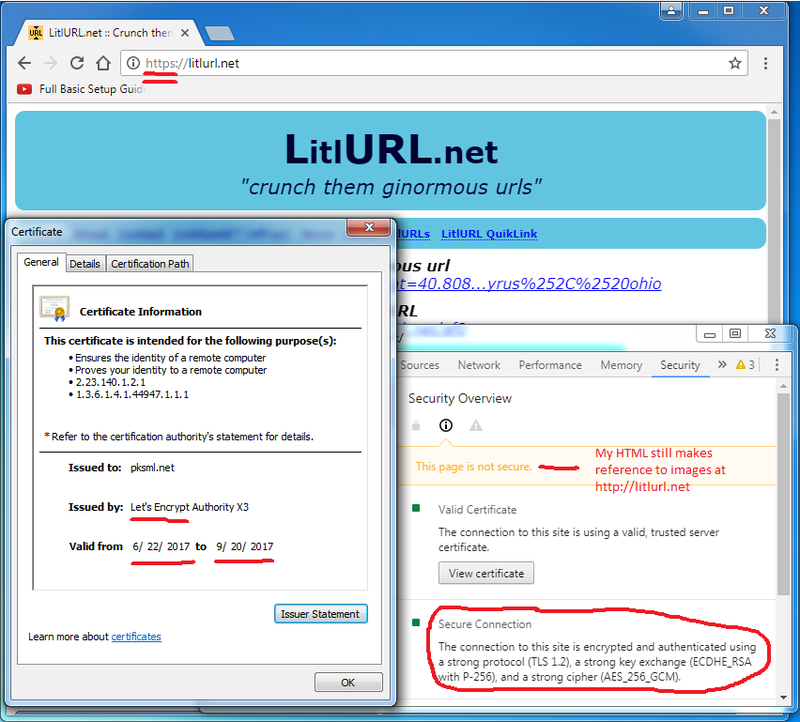 Let's Encrypt has an article about that specific issue in https://letsencrypt.org/docs/certificates-for-localhost/ and suggests that the only solution is to create a self-signed certificate.